Twin Size: L84.5" x W44" x H55"
Full Size: L84.5" x W59" x H55"
Queen Size: L88.5" x W65" x H55"
King Size: L88.5" x W82.5" x H55"
Athens storage bed is available in twin, full, queen and king sizes made by At Home USA. Modern style in black upholstery with button tufted headboard. Lift-up platform and storage underneath is a great convenience for every home. 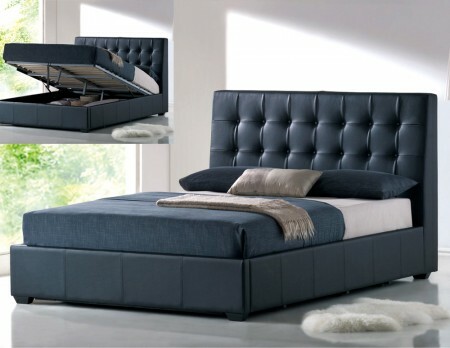 Athens platform storage bed is also available in white color. At home USA is an American Company specializes in high quality modern furniture with creative designs and products that will last for years in your home.